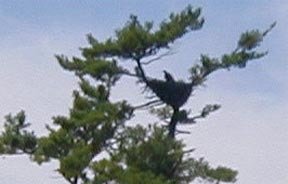 Photo of a juvenile Bald Eagle in its nest on Little Swan Island, across from our summer “camp” on the Kennebec River in Maine. The nest is used year after year. Last summer a mature bald eagle flew right into a tree by our cabin and proceeded to eat a large fish he had caught. By the time I got my camera, he was gone. Usually 3rd weekend in February, Friday through Monday. Get your bird feeder up and start learning to identify your visitors and then report your findings to scientists over this 4-day weekend. Explore how birds are built with Bird Academy’s virtual bird. Turn on and off each system and target particular parts to learn more about them and how to pronounce their names. With more than 100 parts at your fingertips, you can learn bird anatomy quickly and effectively. Then activate flashcard mode to quiz yourself. Lots of photos showing you how to incubate, candle, and raise young birds. From the University of Nebraska – Lincoln. An “ornithologist” is a scientist who studies birds. This is a colorful site with lots of interesting information, including sound files and to help identify birds you may see or hear. What is more fascinating than to see a fully-developed baby chick emerge from an egg? Just three weeks of incubation transforms a seemingly lifeless chicken egg into an active, living being. Just how smart are birds? Did birds evolve from dinosaurs? Which birds are the super athletes of the avian world? How do bird parents protect their eggs and young? What messages do birds’ songs relay? How strong is an eggshell? Experiment and find out! Free Barn Owl Pellet Dissection Lab booklet to download. You’ll also find our Bird’s Eye Discovery Viewer, a great way to add value to your lab experience. In addition, our Owl Pellet Dissection Demo will be helpful in case you have never done such a dissection before. We also sell owl pellets for a reasonable price. Covers bird species, birding, fossils, bird extremes (biggest, fastest, etc. ), the link between dinosaurs and birds, bird anatomy, backyard birding, bird as symbols, classification, evolution, and even jokes. 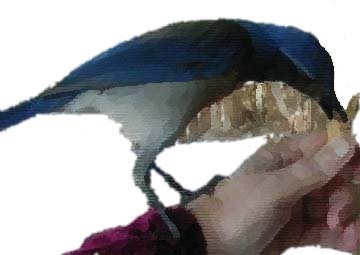 My tamed Western scrub jay, No Fear, opens peanuts while sitting on my hand. She either eats them right away or buries them in the yard. I’ve noticed the squirrels watch her carefully, and steal the hidden peanuts when she comes back for another. Taming and handfeeding backyard birds is a fun project for homeschoolers. Kids from all over are joining with scientists to track ocean-going albatrosses in Hawaii. Don’t worry if you don’t live in Hawaii. This is done with satelite tracking devices. Pictures, songs and calls of some New York State birds. check out the latest National Geographic bird cams here. February each year. Get your bird feeder up and start learning to identify your visitors and then report your findings to scientists over this 4-day weekend. We attracted hummers last year, and Scott witnessed the second fledgling leave the nest. Come find out more about these charming birds. >It’s twins! Just feet from our front door. Come see the photos by Ann Zeise. Do you love to watch the hummingbirds come to your feeder? Then you might like to join this web-based project for students all over the world. Make these with empty Coke or Pepsi bottles. For a dowel, you could also use a pencil. You may need an adult’s help to drill the holes the right size, as determined by what size seeds you will be filling it with. Serves as a helpful guide for people just getting started in the rewarding activity of wild bird feeding and for those who have been feeding their feathered friends for many years. The opportunity to share food and enjoy the mystique of birds at close range provides hours of enjoyment just outside your home. Bird feeding adds diversity to your day and enriches your life. Several plans designed for easy access for observation and cleaning. Specifications for attracting nesting bluebirds in different areas of the USA. All you need to identify birds, make a backyard habitat, and build the right size birdhouse or bird feeding station. Search the Cornell All About Birds site to learn the colors of the birds you don’t know. A variety of artists with different styles show you how to draw realistic and cartoon birds. To learn some simple bird drawings is in fact very easy and I’ll show you here how to do it. Once you know the basics – the “recipe” – it may surprise you how simple it is. Thinking of taking in a pet bird. Learn about basic pet bird care from the association of avian veterinarians. Find even more bird themed ideas on our Bird Pinterest Page. The photos on this page are copyrighted by Ann Zeise. Children may use the photos for personal work not posted on the web. Students should note where they got the photo.